Hi there. 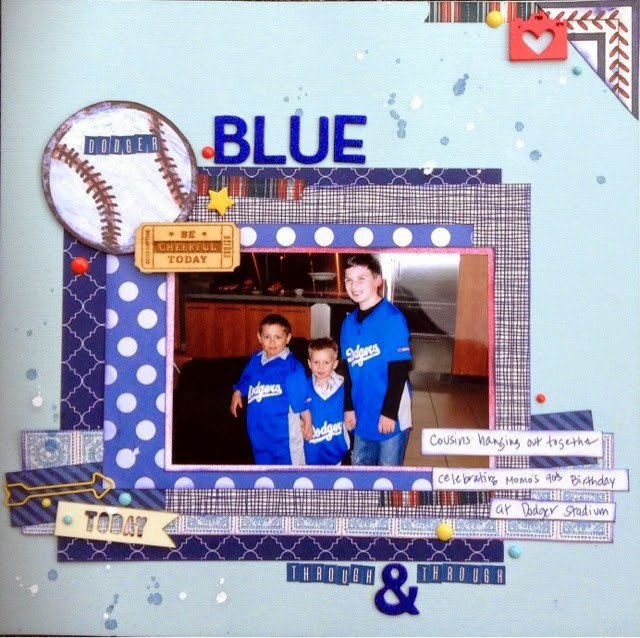 Today's LO is courtesy of ScrapStuff'z Inspired by...It's my turn to share. Here is our inspiration photo. Yup. Dodger blue! We celebrated my Grandfather's 90th birthday at Dodger Stadium. Everyone was wearing Dodger blue. It was a fantastic evening and celebration. Inspired by the blue bottle, I chose to do this LO in a variety of blue patterned papers that were deeper shades of blue than in the photo. I added little bits of red and yellow for contrast, and just a few baseball themed embellishments. The page came together quickly thanks to this fantastic sketch from Boys Rule Scrapbook kits. 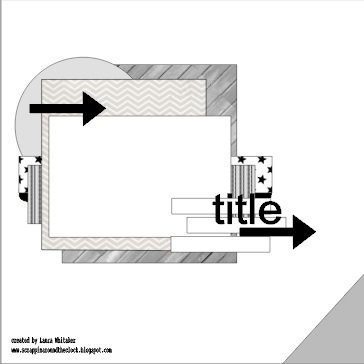 I kept the concept the same but added a few layers, changed the shape and size of some of them and moved the corner detail to the top of the page. I also moved the title. Thanks for looking today at my creative view. Now it's time for you to create something Inspired by. the photo. Supplies: CS-Bazzill, PP-Theresa Collins, Reminisce, Sassafrass, Echo Park, unknown, washi-Recollections, enamel dots-MME, clip & epoxy-Freckled Fawn, Wood chips-Freckled Fawn, Basic Grey, Mist-Studio Calico, Alphas-American Crafts. Love your take on the sketch Devra and you did such a great job with the colors too! super inspiring! Thanks so much for playing along at Boys Rule! Adorable page!!! Loving the color and all the layering!!! Fabulous colors, awesome design and a scrapfabulous layout!!! Thanks so much for playing along with us at Boys Rule! !